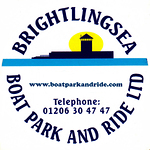 Big Wednesday, sponsored for the third year running by AOC (UK) Ltd, is something of a Pyefleet Week institution. Initiated by the family of the late Reg White to honour Reg and his Tornado Olympic Gold Medal winning crew John Osborn, the day traditionally comprises a single all in handicap "gold medal" race, which does not count towards the series points, followed by a huge Caribbean Beach Party. This year the loss of races earlier in the week meant that an additional series race was added for the blue group classes in the morning, before normal Big Wednesday service resumed after lunch. It was another stunning day with a terrific sea breeze which built from mid morning to provide spectacular conditions. The blue group's second race of the series means that all fleets have now completed the same number of races. In the Fast Handicap Chris Matthews and Sarah Bines were race winners in a Merlin Rocket with Ed Evans' RS300 second and Richard Goldklang and James Maybe's RS400 third. Fourth place in the race was sufficient to give the Fireball of Roger Etherington and Jo Adams the overall lead in the class with Matthews/Bines second and Dave Conlon and Ed Gibbons sailing an RS800 now third overall thanks to yesterday's win and a ninth today. In the Mirror class Melissa Heppell and Louis Hiscocks and Katy Jenkins and Ameie Hiscocks replicated their first race results with first and second place respectively, which naturally puts them into first and second overall. Stephen Heppell sailing with granddaughter Josie took third, but having not sailed the windy first race they now lie in fifth overall. Fourth in today's race to put them into third place overall were Malcolm Goodwin and granddaughter Kaya Nawrot. The Laser Handicap fleet is also now tied at the top of the leader board as Alex Clarke sailed his Laser Radial to win from Steve Williams' standard - the exact reverse of their first race results - so both boats now count three points. Richard Herbert claimed another third place and now sits third overall with six points. In the Medium Handicap Will Taylor took his RS700 to a nice race win from Pete Kyne in a Solo, with fellow Solo sailor Paul Aldridge third. Taylor and Kyne now lead the fleet overall, with Eddie Bridle's RS200 fourth in the race and shifting up into third overall. 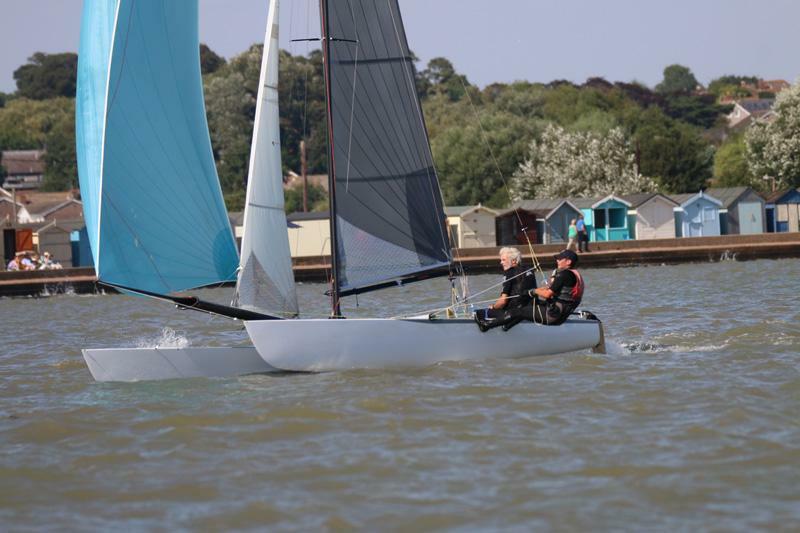 Elizabeth Hill's Topper was the top boat in the Slow Handicap fleet, beating the Topaz Race of Benjamin Pearson, with Harry McTiernan's RS Tera Sport third. After a quick pitstop for some well deserved lunch and refreshments it was all back out onto the water for the Big Wednesday Race. With 55 boats taking part, Big Wednesday race officers Alan Hicks & Craig Bond set up a nice long line as close to the club house as they could and sent the fleet off into a building south easterly of around 10 knots. With the land heating rapidly it wasn't long before the wind had increased to 18 knots and with wind against the newly ebbing tide there were some great waves for surfing. 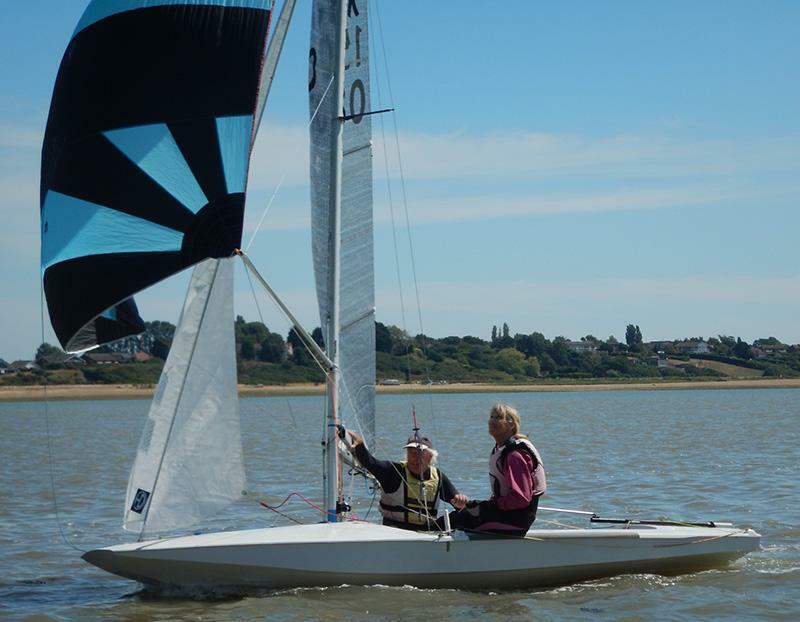 The Big Wednesday Race is open to day entries as well as those competing in Pyefleet Week overall and so it always attracts an eclectic entry list. From Andy Conroy's gaff rigged Mevagissey Tosher, to Graham Bridle's 18 Foot Skiff, via a Melges 24 and several foiling Moths it was most definitely a very mixed fleet. 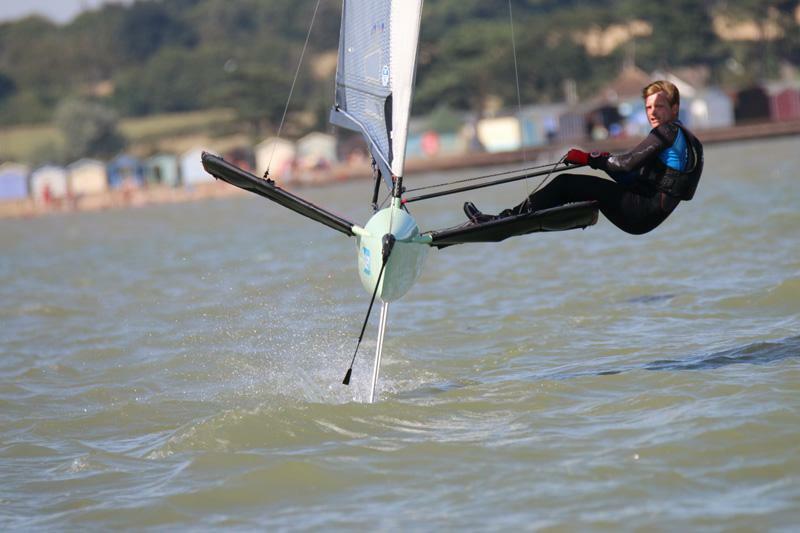 49er Olympic Bronze Medallist Simon Hiscocks was quite literally flying in his moth, but missed out a mark in the course so was forced to retire, leaving fellow moth pilot Ben Clegg a clear run for overall victory. John Payne and Josh Hunt sailed their Tornado into second place with the F18 of Nick Barnes and Mark Dyvig in third. At the Big Wednesday Prize Giving Ben Clegg Proudly lifted the beautiful wooden hand carved Big Wednesday Gold Medal Trophy which features a Tornado at full chat with a backdrop of Brightlingsea's iconic Bateman's Tower and promenade beach huts. 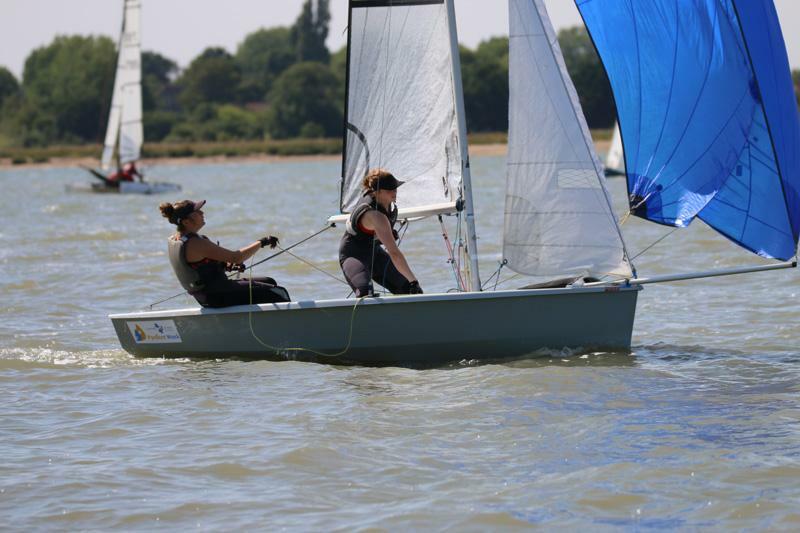 The Trophy for the leading cadet entry went to Rebecca Bines and Connie Hughes sailing an RS200, who had finished in sixteenth place overall. 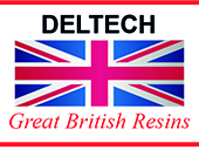 The trophies were presented by Reg White's son Mark who was also representing day sponsor AOC, the leading global supplier of resins, gel coats, colorants and additives for the composites industry. Alongside the racing there were a host of fun Big Wednesday activities with games on the beach, the chance for the younger cadets to test sail an Open Bic, sea swimming sessions and a very closely fought crabbing competition in which the prize winners were Katie Bees, Morgan Cross and Freya Campbell. 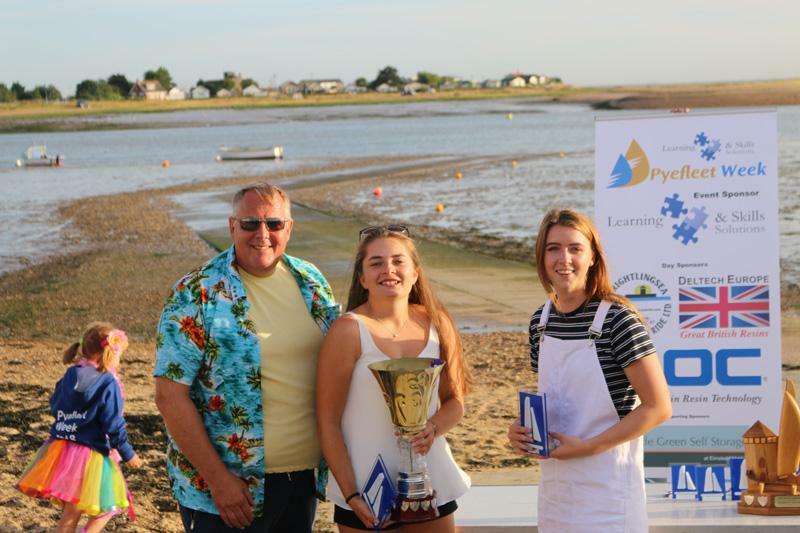 After the prize giving a sumptuous BBQ was served by the White family before everyone got their groove on and danced the night away on the beach to a Caribbean steel band. Further information and full results are available from www.pyefleetweek.com or by contacting Fiona Brown on fiona.brown@fionabrown.com or 07711 718470.